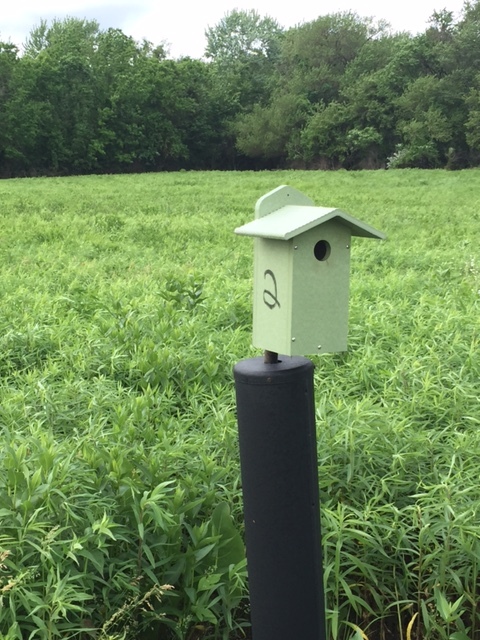 Once nearly eliminated from Illinois, local bluebird enthusiasts who have put up and regularly monitor bluebird boxes are helping to grow the population of these birds locally. At the Lincoln Memorial Garden and Nature Center in Springfield, Illinois, there are 14 such bluebird houses that are regularly monitored by volunteers to help encourage the population of bluebirds through these nesting stations. Last year, it was estimated about 19 bluebirds fully fledged birds left the nests from the Lincoln Memorial Garden bluebird houses. Thus far in 2016, the number of fledged bluebirds at the gardens has been disappointing at zero to date. While some of the houses have contained hatched young bluebirds, unfortunately these birds did not survive. House monitors believe buffalo gnats were likely predators of the small birds. Bluebirders in several states have reported losses of baby birds due to the gnats. Nests were recently sprayed at the Gardens with pyrethin solution (an organic compound) to help ward off gnats to help the young birds survive. (Small birds are covered in process). 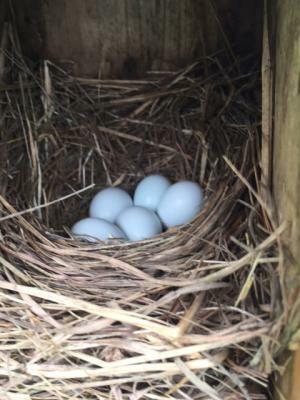 Good news is a new nest with five bluebird eggs was reported on Friday, May 27 (see photo). House monitors are watching closely for the eggs to hatch and the young birds to develop and are ever watchful for any pests that might be harmful to the young birds such as gnats, mites, ants, etc.. The Tree Swallow which lines its nests with feathers also favors the bluebird houses by building and laying eggs and raising their young in the houses. There are several broods currently inhabiting the houses right now. Ten University of Illinois Extension Master Naturalist volunteers take rotating shifts checking the bluebird houses weekly and report their progress to The Cornell Lab of Orinthology at www.nestwatch.org . Lincoln Memorial Garden and Nature Center is located at 2301 East Lake Drive, Springfield, IL, http://www.lincolnmemorialgarden.org/. The Garden is open from dawn to dusk.